One year ago today, Stephen Harper turned an "unwanted election" into his first majority government, Jack Layton and the NDP soared to never before seen heights, and Liberals spent the evening curled up in a fetal position sobbing in the corner. On political anniversaries, it's tempting to give each party a thumbs up or thumbs down, but the past year has been less clear cut, as the major parties try to figure out where they fit in Canada's new political dynamic. 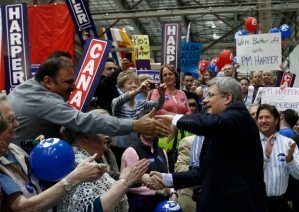 It feels like a "Harper majority" was hyped longer than the Phantom Menace – and the end result was just as much of a letdown. After years of being told by both the right and left that a Harper majority would mean an unrecognizable country, it turns out a Harper majority looks a lot like a Harper minority. I hardly think when people warned of his “hidden agenda”, abolishing the penny is what they had in mind. So if the past year has proven anything, it’s that Stephen Harper has always been and always will be an incrementalist. He has made some changes - goodbye gun registry, so long Katimavik...CBC and Statscan, you can stay, but we’ll make your job a bit harder, in the hope the public begins to question your value. These are bigger changes than he made during the minority years, but the man isn’t reshaping Canada as we know it. The past 13 months have been the most turbulent in this “new” party’s long history, filled with highs, lows...and voting delays. The supporters web page says: Supporters are the new generation of Liberals who will speak up for change, come to local events, become members, join the Victory Fund in our ridings, and become donors. This makes it sound like supporters are card carrying Liberals without the cards. Is that the actual intent? For example, I would like to cast a vote for the next Liberal leader, but I have no intention of joining the Liberal party (or any party) and I cannot today tell you how I will vote in the next federal election. Does my commitment phobia make me ineligible to be a "supporter"? BTW, no hard feelings if it does, just trying to get a clarification. By Jim R, at 7:19 p.m.
To be fair to the Bloc, they did elect a new leader (pop quiz, name their leader) and got a turnout on par (or just slightly less) than the NDP leadership race. By Ian, at 7:27 p.m.
Daniel Paille is the Bloc leader. I hear he's on the Bloc's rightwing. He doesn't have a seat. By Anonymous, at 8:09 p.m. The Bloc may very well rise again, though Mulcair's victory likely makes that less likely. By calgarygrit, at 9:26 a.m.
Jim R - That website description aside, the intent (as I understand it) of the supporter system is to invite in people like yourself who may have issues about commiting to being a full fledged card carrying member, but who want a say in the leadership and who generally get behind the Liberal Party's over arching principles (even if you don't always vote for them). In the long term, some of those supporters will eventually become more active in the party, but that's by no means a precondition. So by all means, sign on up! By calgarygrit, at 9:28 a.m.
Jim R... If you are not actually committed to a party... and are not (at least) of a "liberal-ish/centrist/moderate/progressive" mindset, then you probably don't qualify as a "supporter". The intent of the supporter category is to have people truly interested in the party, or the moderate/centerist ideals the party carries to have a say (in leadership, etc.). If you aren't committed, then you likely aren't of this category, but I'm sure the party would gladly take your contact info, so you can be solicited for your thoughts on policy and platform ideas going forward. Basically this lets you have a say in the party process/platform, and also allows the party to reach out to you. As a social media expert myself, I'd say the key is putting the party in touch with you. Brilliant idea... as the party likely would not be able to discuss these matters with you in as direct a manner under previous circumstances. @Anon 1:47, "so you can be solicited for your thoughts on policy and platform ideas". Solicited, sure. For donations, no doubt. But when have the election policy leaders of the Liberal Party ever worried about what their grassroots thought about policy? Weren't there resolutions at the most recent convention trying to force "at least a couple" of the policies passed at convention into the Platform? ... Ignatieff's comments on BBC last week remind us that he's never cared, (not even during the election campaign) about the federation, and that he views separation with the clinical sang-froid of a detached, uninvolved observer. No Lincoln, this guy. By Jacques Beau Vert, at 11:29 a.m. Thanks for the responses CG and Anonymous@1:47PM. FWIW, I consider myself to be fiscally conservative and socially liberal. I could go on and on (and on) about where I fit in things, but I'll leave it at this: both the social conservatism of many CPC supporters (and MPs) and the fiscal lackadaisicalness of many NDP supporters (and MPs) leaves me cold. And since this is a Liberal blog, I'll mention that I think Paul Martin was an excellent finance minister. Personally, I think the Liberal Party should be aggressively staking out this ground (of course, I'm hardly unbiased). Throw in a willingness to take a strong stand against the corporations and unions when it makes sense, and you've got something that differentiates you from the CPC and the NDP, and should resonate with the proverbial middle class, average voter. You may have to slay the occasional sacred cow on the way, but if you can make a cogent argument for it, so what. Enough ramblings, I'll keep an eye on the supporter thing - like I said, I would like to vote for the next leader (but only if my vote is wanted). By Jim R, at 6:59 p.m.
By Jacques Beau Vert, at 5:21 p.m.
By margahayuland, at 7:25 p.m.
By jaket kulit murah, at 9:26 a.m.
By John Gibson, at 4:49 a.m.
visit here maybe its so nice to read here a interesting topics all day. So ill be back more to check more updates and new comments. By Loran Fabyuel, at 1:22 p.m.
By Fikri Ferdiansyah, at 3:59 a.m.
By Iniciar Sesion, at 4:01 a.m. Happy anniversary! I appreciate your confidence to lead the people with your position. I hope that you can perform well as like the past year. By Essay Writing Service, at 7:40 a.m.
amazing article i like it www.admission-service.com thanks for sharing this post . By Inez Shutts, at 9:07 a.m. I have enjoyed reading the articles and the author has showcased unique and rare creative writing skills. Additionally, I have increased my general knowledge about the subject matter of the articles. Thank you for posting this article and students in this forum can now access professional Research Writing Help by visiting our site. By Albert Smith, at 8:18 a.m.
By شركة المثالية لتنظيف, at 4:39 a.m.
By Hikmat, at 2:17 a.m.
By 千禧 Xu, at 2:27 a.m.
By Alice Taylor, at 10:40 p.m.
By Thu Lê, at 10:59 p.m.
By Games 2 Girls, at 12:48 a.m.
By Blogging Pursuit, at 4:53 a.m.
By ngocanhng, at 3:37 a.m.
By learn to fly 2, at 10:47 p.m.
By Neil Jakson, at 10:26 a.m.
By hooda, at 8:37 p.m.
By مروة محمد, at 8:16 a.m.
By Patricia Howell, at 4:39 a.m.
By Felix Frick, at 8:33 p.m.
By Obat Penyakit Kulit, at 11:36 p.m.
By Admin, at 2:16 a.m.
By kingroot apkapp, at 2:05 a.m.
By Dian Ardi, at 2:00 a.m.
By Ishikarajput, at 10:44 a.m.
By Dian Ardi, at 3:21 a.m.
By Python Programming Language Assignment Help, at 6:07 a.m.
By Online SPSS Homework Help, at 6:44 a.m.
By Lutpi Kurniawan, at 4:56 a.m.
By Eillen Sharma, at 5:16 a.m.
By call Girl, at 5:30 a.m.
By Naincy Kumari, at 5:34 a.m.
By Cikun Chau, at 12:36 a.m.
By Fikri Ferdiansyah, at 12:30 a.m.
By coursework writing service, at 4:57 a.m. I was surfing the Internet for information and came across your blog. I am impressed by the information you have on this blog.Thanks a lot for sharing this! By dissertation writing services uk, at 5:33 a.m.
By david bruce, at 12:47 p.m.
By Mihail377, at 5:23 p.m.
By Mihail377, at 4:14 p.m.
By Gawe Sare, at 3:31 a.m.
By Kolkata Escorts, at 1:03 p.m.
By Cikun Chau, at 2:26 a.m.
By Fikri Ferdiansyah, at 3:16 a.m.
By Unknown, at 4:38 a.m.
By Siti Nurazizah, at 3:48 a.m.
By Kolkata Indpendent Call Girls., at 5:11 p.m.
By Kolkata Indpendent Call Girls., at 9:58 a.m.